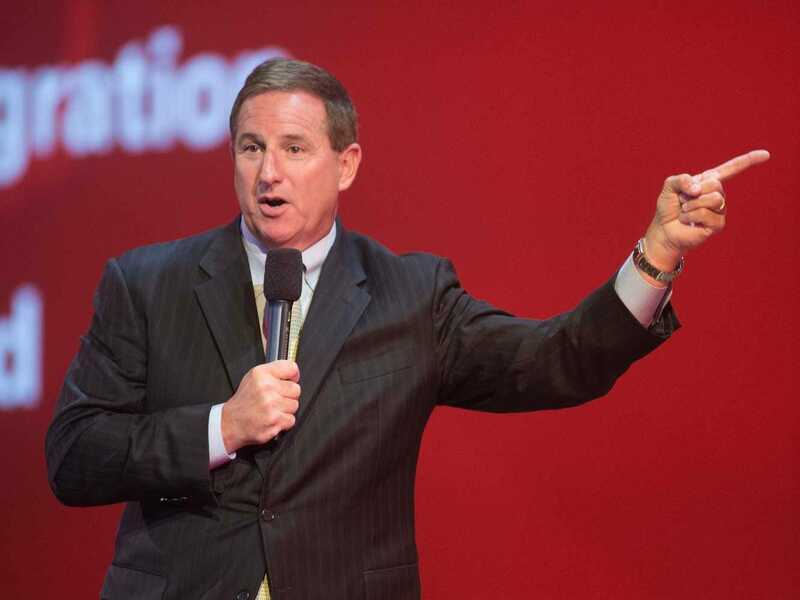 On Tuesday, Mark Hurd, co-CEO of Oracle, criticized SAP's acquisition strategy. Last November, SAP announced it would acquire Qualtrics for $8 billion, right as Qualtrics was about to go public. Hurd said that Oracle focuses instead on buying companies that fits with its strategy and on looking into vertical applications. Mark Hurd, co-CEO of Oracle, says that the database giant is certainly looking to buy more startups — but doesn't plan on doing it the way that its rival SAP does it. "We're not buying somebody to just buy them. We're buying companies that fit into our portfolio," Hurd said onstage at the Goldman Sachs Technology and Internet Conference on Wednesday, in response to a question from the on-stage interviewer about how Oracle and SAP approach acquisitions. In November, SAP announced it would acquire online market research software startup Qualtrics for $8 billion. The news came close to the last possible second, as Qualtrics was about to go public. Hurd's comments were almost certainly in reference to this very recent mega-deal. Arlen Shenkman, executive vice president of global business development and ecosystems at SAP, previously told Business Insider that Qualtrics was a desirable buy because of its foothold in the cloud software market. That could complement SAP's offerings, as the $128 billion German database giant looks to become a bigger cloud player. But Hurd indicated that he doesn't think much of how SAP goes about the business of buying smaller companies. "It's more important we find someone we want to buy and how they fit with our strategy," Hurd said in response to the same question. "What we're not doing is what [SAP] is doing,"
Hurd says that the problem with acquisitions is that it's hard to make whatever new product you just bought work together with your existing product portfolio. That frustrates customers, he says, who expect everything a company like Oracle sells to work together. And so, companies like Oracle usually have to do dramatic revamping, anyway, he says. "When you introduce a separate app, you lose that capability. More times than not, you buy the app, and what do we end up doing? You end up rewriting the app," Hurd said. Hurd says that instead, Oracle will focus on making acquisitions that help it compete to win deals in specific industries. And to that end, he says, Oracle is always on the lookout for good opportunities. "We've been active with that in the past couple of years," Hurd said. "We're always looking. There isn't a week that goes by when we're not talking about something, but it has to fit strategically into what we're doing." Hurd also said that he disagreed with SAP asking customers to completely transition to its cloud-based S/4HANA platform by 2025. After that, SAP will stop providing support for its very popular Business Suite enterprise software. "I think that is just a terrible damn idea," Hurd said. "Let's say you go to your board and say, 'We're going to move from this thing to this other thing, and it's going to cost $350 million.' My guess is, the board will say, 'What do we get for $350 million?' Well, we moved from this thing to the HANA thing." Representatives for SAP and Qualtrics did not immediately respond to a request for comment.